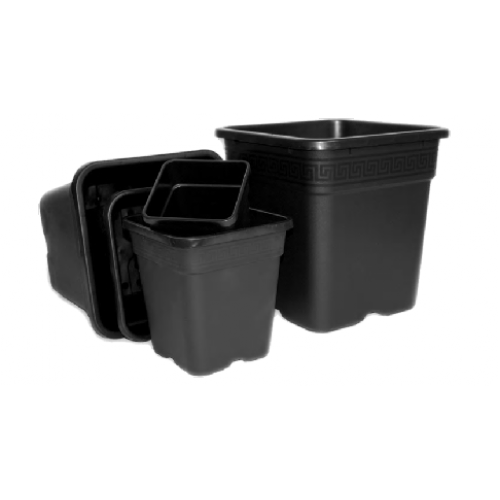 Atami wilma square plant pots are ideal for optimal plant growth and development. In order to keep the plant healthy, its root must have enough space in the pot to develop and absorb all nutrients. Square plant pots allow maximum utilization of space, and in this way, your plant will be healthier and give higher yields. The square shape of the pots is functional and more practical than traditional round pots because they allow the pots to be placed next to each other without any gaps and effectively fill in space in your grow room. Atami square plant pots are made of strong plastic that is sustainable and long-lasting and can be used many times for different types of plants. Their usage is easy: fill the pot with your chosen growing medium and leave 2 inches at the top for easier watering. Transplant your plant into a mixture. Square plants pots are produced in a wide range of sizes, from the very small to full-size, to allow optimum growth at various stages of the plant.